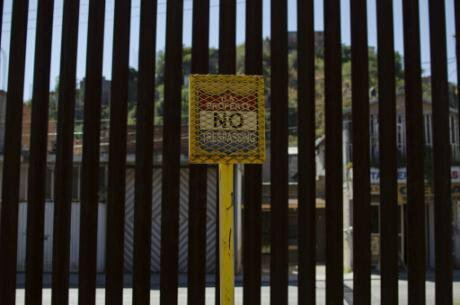 A ''No Trespassing'' sign marks the U.S./Mexico border wall. PAimages/Graham Charles Hunt Zuma. All rights reserved. In 2006, both Republicans and Democrats, including Obama, voted to fund President Bush’s 1100km double-layer reinforced fencing and enhanced security along parts of its 3,200km southern border with Mexico. Obama further strengthened this policy of securitisation, and was later described as having “the most border patrols and border security deployed at the border of any pervious president”. This was the very same president who in 2014 came to earn the nickname ‘deporter-in-chief’, having deported over 2.5 million immigrants during his two terms in office. US policy on immigration from the South has typically confronted symptoms with force, rather than tackling the root causes – and while Trump will throw a little more fuel on the fire, in doing so he is reinforcing the trend set by his predecessors with added vengeance. Then perhaps it is the new President’s promises to bring factories home and the renegotiation of trade deals that present the biggest threat to Mexico. On a platform of protectionist trade policies, Trump has blamed unfavourable trade deals (namely NAFTA) and transnational supply chains for economic woes back home: job losses, factory closures and wage depression. He has failed, however, to address the real impact of technological change in the US’ post-industrial economy job market. Nevertheless, he has managed to convince much of America and his promise to bring back jobs and dignity to the Midwest - particularly the Rustbelt states of Ohio, Michigan and Indiana – is the reason why so many of his supporters have been able to look past his unpresidential persona. No matter how fearless he is of controversy, there is only so far Trump will be able to push his agenda. And before even sitting at his desk in the Oval Office, Trump claimed credit via Twitter for persuading Ford to retain a factory and 700 jobs in Kentucky, instead of moving them to Mexico. (The fact that Ford’s planned changes would have resulted in 0 job losses is by the by). Yet Trump will soon come face to face with the real implications of his promises. Let’s take Ohio for example, a state in which he narrowly beat Hilary Clinton with 51.2% and had claimed “manufacturing is down by 30%, 40% sometimes 50%” as a result of NAFTA (again, the real impact is actually closer to 1%). This is a state for which Mexico represents its second largest export market, mainly in the form of vehicle parts, plastics, iron and steel products. Mexico – as the US’ 3rd largest supplier of import goods – uses these resources to return vehicles ($74m), electrical machinery ($63m), machinery ($49m) and optical/medical instruments ($12m) back into the US market. The agreement has certainly faced just scrutiny, with a Center for Global Development report showing the US-Mexico wage gap having grown, not shrunk since 1994, and only modest benefits on both sides of the border. But, echoing current post-Brexit discussions in Europe, the solution is not hostility between countries, or the cessation of economic agreements, but more cooperation and better economic integration. Any move to attack the agreement, increase trade restrictions on Mexican imports and disrupt the inter-state supply chain would likely trigger a retaliation from Mexico in equal measure. Prices would rise, as would social tensions, and there is no guarantee that the result would be a net increase in US job opportunities. This impact would be immediate and detrimental for American families in the communities Donald Trump promised to protect. Furthermore, the President would have to pull off a constitutional coup to do so, and this in itself carries political consequences. For short term credit, Trump is more than capable of enacting his executive powers to see this happen and as the potential move to impose 20% tax on Mexican goods to fund the construction of the border wall suggests, he is more than willing to take US-Mexico relations to an all-time low. But in shooting America in the foot, he risks destabilising a popular support base and losing political allies. And no matter how fearless he is of controversy, there is only so far Trump will be able to push his agenda. So, Mexico is likely to face more than political posturing from Trump – but at a price. And, “so long as Raul Castro doesn’t go too heavy on the Che Guevara and treat the US like it’s the 1950s” (in the words of Forbes), the rest of Latin America is expected to remain with the status quo. But there’s a problem here: the status quo isn’t good enough and Trump’s presidency is likely to produce the political and economic conditions for things to deteriorate. But if the US turns its back to Mexico and Latin America, is the region ready to stand up on its own? The expanding role of China in Latin America has provided an alternative to the unpopular Cold War narrative of American imperialism. Seen by some as the strengthening of South-South cooperation – and a direct challenge to the Northern hegemony – the extractive industries of Latin America were central to fulfilling high levels of Chinese demand, and consequential growth, from the 1990s on. So much so that between the period of 1975 and 2006, bilateral trade grew from $200m to $70bn. And while the recent commodity slump dampened Chinese trade in the region, it has not curbed its activity. Chinese loans in the region rose sharply in 2013 and 2014, with $22.1bn of new Chinese loans in 2014 representing more than the combined value of loans from the region’s two traditional multilateral lenders (the World Bank and the Inter-American Development Bank) – particularly in Venezuela, Brazil and Argentina. And while the global financial institutions of the liberal world order attach strict economic and political conditionality to lending, China offers ‘no strings attached’. However this approach can be misleading, and with loans more often than not tied to resource and infrastructure deals, the region is certainly not free from the foreboding figure of imperialism. This is a welcome alternative to the countless covert (or not so covert) US interventions of the past, with their intrusion into Latin American nations’ popular sovereignty and a disregard for their self-determination. However, it is also an absolute withdrawal of responsibility for protecting the quality of democracy and civil liberties in the countries China is engaging with. The objective of stability is therefore an end, but the rule book for the means is thrown out of the window. President Trump’s catch-phrase ‘America first’ echoes this non-interventionist approach, but has wider implications. “We do not seek to impose our way of life on anyone”, he said in his inauguration speech. And yes, again, there might be a justified wave of approving nods from the many who are fed up of ‘Western’ interventions in the name of democracy, but this also gives world leaders a clear message: the rules of the game have changed, and the red-line of shoulds and should nots has just been taken down several notches. There are few places where this will be a more dangerous message than in Latin America. We have already seen China’s ‘no string attached’ approach threaten the rise of inequality, as power and wealth is consolidated by those at the top, at the expense of popular involvement in politics. Donald Trump’s disregard for democracy standards or civil liberties and his war on the media only gives these political elites more tools at their disposal to maintain their preferred status quo and quell the civil societies that have been flourishing in the region over recent years. Many politicians, civil society organisations and engaged citizens have shown their capacity of mobilisation in recent years and will fight to ensure the red-line of democratic and civil standards is not forgotten by their country’s leaders. Latin America is a region of relatively young, and rather fragile democracies. Through increasing citizen participation, and expanding civil societies, countries are finding ways to cultivate their own interpretations of a just and vibrant democracy. But in the face of Trump, a reaction could come: many politicians, civil society organisations and engaged citizens have shown their capacity of mobilisation in recent years and will fight to ensure the red-line of democratic and civil standards is not forgotten by their country’s leaders. Without these standards, countries in the region could quickly slide into a right-wing populism that will erode the decades of hard work put into achieving democracy. “[Trump] is so crude that he will generate a reaction in Latin America which will build more support for progressive governments“. The upcoming elections in his country, on 19th February, will prove him right or wrong.